Pamplin Media Group - On your mark ... get set ... find those eggs! 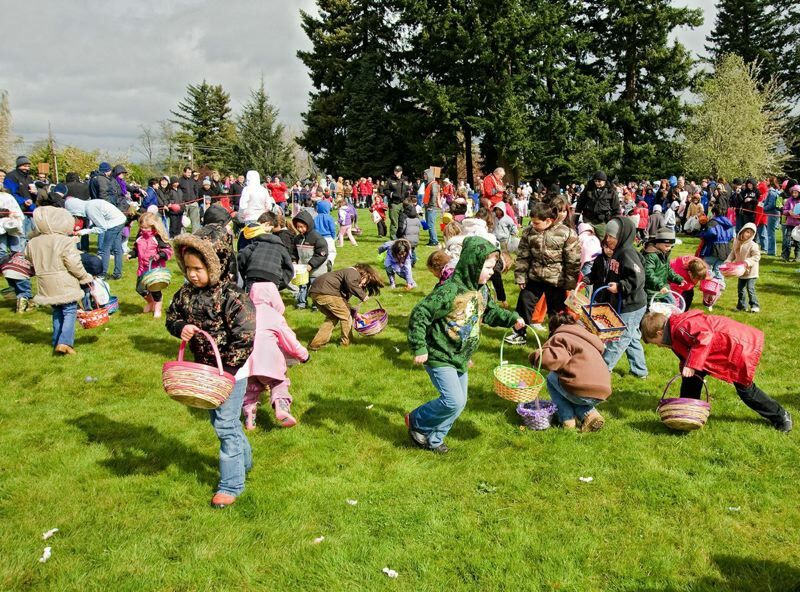 Youngsters and the young at heart are invited to go hopping mad this weekend, when civic groups and church organizations across East Multnomah County offer several Easter egg hunts. Bring a camera, a basket and join in the thrill of the hunt. n City of Wood Village 31st annual Easter Egg Hunt: 8:30-11 a.m. Saturday, April 20, Donald Robertson Park, 24300 N.E. Halsey St. Children ages 3-9 can search for 31,000 candy-filled eggs beginning at 9 a.m. The city won't be checking IDs if kids slightly outside the age range also want to participate. A special needs hunt for all ages will be held at 8:30 a.m. The hunts start at 10 a.m. for children aged 3-4; 10:10 for kids 5-6 and at 10:20 for youth aged 7-9. The Eater Bunny will be available for photos at the park's gazebo. More information: www.woodvillageor.gov/wp-content/uploads/Easter-Egg-Hunt-Detailed-Flyer_Page_1.jpg. n Easter Jubilee: 1-3 p.m. Saturday, April 20, St. Timothy Lutheran Church, 14500 S.E. Powell Blvd., Portland. Egg hunts will be available for children ages infant to 10. The event will also feature a clown, crafts, and pictures with the Easter Bunny. n Kiwanis Club of the Columbia Gorge Easter Egg Hunt: 10 a.m. Saturday, April 20, Sam Cox Building at Glenn Otto Community Park, 1102 E. Historic Columbia River Highway. The Easter Bunny is scheduled to make an appearance. The city of Troutdale will host a pancake breakfast before the Easter Egg search. The cost for breakfast is $7 for adults and kids; $4 for seniors 60 and above; $3 for kids age 4-5 and kids younger than 3 are free. This event is a fundraiser for the Boy Scouts of America Troop 174. More information: www.troutdaleoregon.gov/commdev/page/annual-easter-egg-hunt-pancake-breakfast. n Community Egg Hunt: 10 a.m. to noon, Saturday, April 20, Powell Valley Church, 1335 S.E. 282nd Ave., Gresham. The event will feature carnival games with prizes in addition to searching for thousands of eggs. n Easter Egg Hunt: 1-3 p.m. Saturday, April 20, Good Shepherd Community Church, 28986 S.E. Haley Road, Boring. The event will feature 5,000 Easter eggs along with inflatables and carnival games. 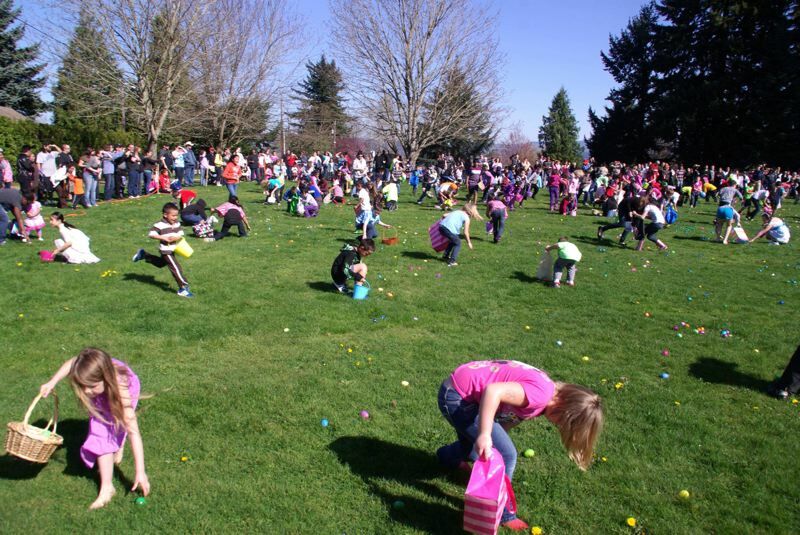 n City Park Church Community Egg Hunt: 9 a.m. Sunday, April 21, Main City Park, 219 S. Main Ave., Gresham. All are welcome to join in Easter services at the church, 58 W. Powell Blvd., following the egg hunt.